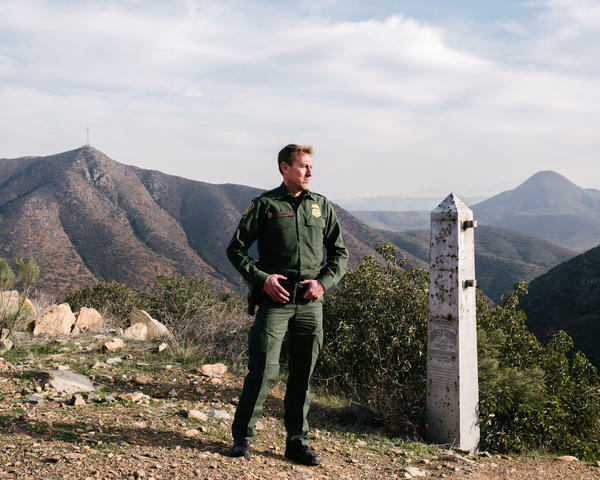 Chief Patrol Agent Rodney Scott stands near an old border monument at the base of the San Ysidro Mountains in southern San Diego County where current fencing ends. Senior Border Patrol officials are taking up President Trump's call for more miles of border barrier, pushing back against congressional Democrats who say additional fencing is unnecessary. During a ride-along with the Border Patrol on Wednesday in its San Diego sector, agents made it clear that the fence deters illegal crossers. "I started in the San Diego sector in 1992 and it didn't matter how many agents we lined up," said Chief Patrol Agent Rodney Scott. "We could not make a measurable impact on the flow [of undocumented immigrants] across the border. It wasn't until we installed barriers along the border that gave us the upper hand that we started to get control." 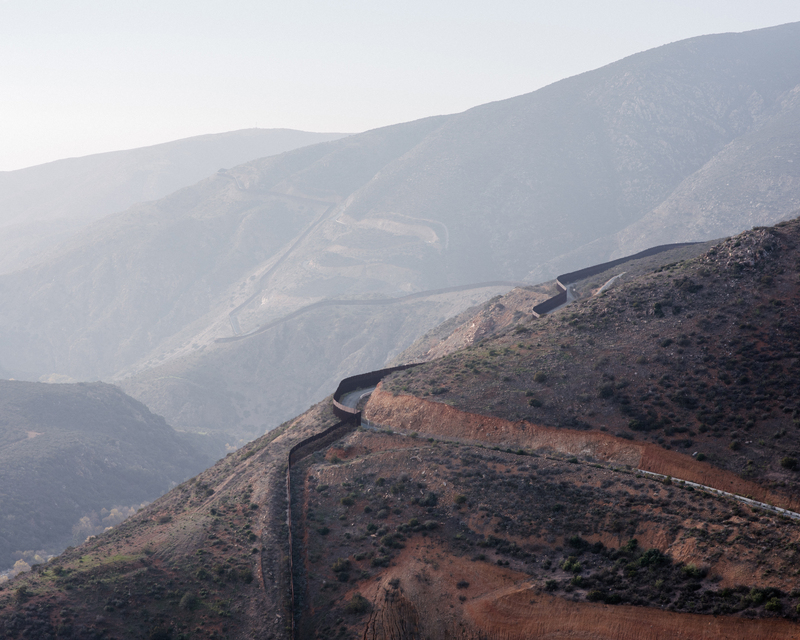 A view of the U.S.-Mexico border fence as it winds through the rugged San Ysidro Mountains southeast of San Diego. The administration is calling for 5 more miles of new barrier in this area. Forty-six of the 60 miles of border in the San Diego sector are currently protected by some type of barrier. Scott says in the places where he has two levels of fencing he achieves 90 percent operational control. Scott was interviewed in a clearing at the base of the San Ysidro Mountains, a rugged sierra in southern San Diego County. For years, agents have considered the harsh terrain here to be a natural deterrent to illegal crossers. It is mainly Bureau of Land Management land with rocky inclines covered in cactus and juniper. 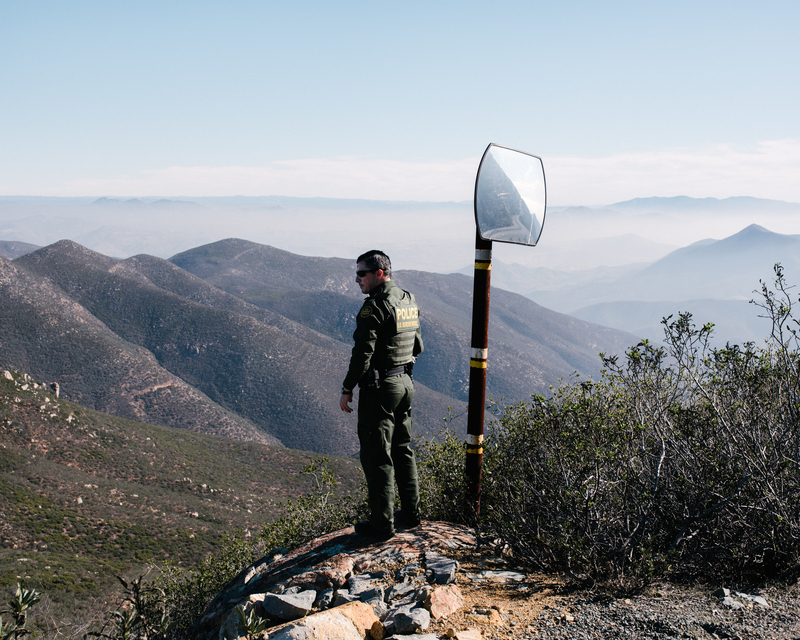 Even though the traffic here is at relatively low levels, the San Diego sector is now seeking 5 miles of additional fencing across this mountainous ground to stop the illegal movement of humans and drugs. "Every night people come through this canyon," said Supervisory Border Patrol Agent Michael Scappechio. "If we put in a border barrier, we can utilize the [agent] manpower elsewhere." He added that a steel fence is a smarter border defense than having agents in ATVs or on foot chasing people crossing illegally through remote and rocky ravines, which is dangerous for the pursuer and the pursued. 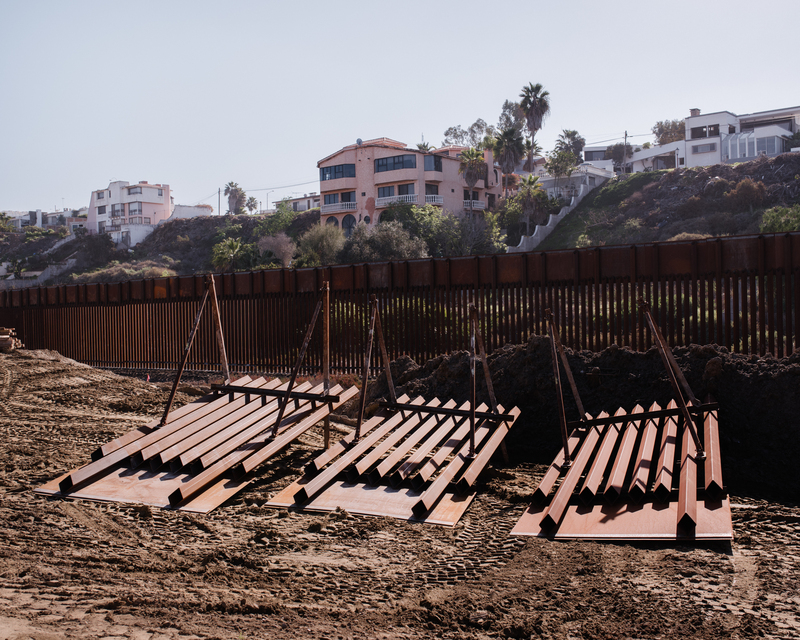 Currently, according to the spokesperson for the CBP's San Diego sector, they're spending $10.5 million a mile to replace 14 miles of old fencing with 18-foot-tall, state-of-the-art, steel bollard barrier between San Diego County and Tijuana. Trump has asked for an additional $5.7 billion for 234 miles of new steel slat fencing in sections along the entire U.S.-Mexico boundary. That works out to $24.4 million a mile. Critics have demanded to know why Trump's wall is so much more expensive than current fence construction. A senior official with Customs and Border Protection told NPR that the added expense comes from building access roads, installing sensors and acquiring private land — which accounts for most of the borderland in Texas. While Trump argued on Tuesday night in a prime-time address to the nation that a border wall was critical to border security, Democrats took issue. "In no way did the president's speech last night make a persuasive or even a new case for an exorbitantly expensive border wall," argued Senate Minority Leader Chuck Schumer, D-N.Y. Asked what he would tell opponents to Trump's wall, Scott said sector chiefs like him have actually been asking for more tactical barriers for years, "and all of a sudden it got unbelievably political overnight." A veteran Border Patrol agent in the San Diego sector, who asked not to be named, said he and other agents are in favor of more miles of robust fencing. "Natural barriers don't work anymore. [Illegal crossers] come right through mountains and deserts now." He added, "But holding agents and federal employees hostage over this fence is crazy." He spoke on the day his CBP paycheck should have been deposited in his bank account but was not owing to the government shutdown. Some Border Patrol agents say privately that the administration is putting too much emphasis on the wall and it needs to keep a more holistic vision of border security that includes technology such as remote mounted cameras, sensors, lights and tethered spy blimps, as well as manpower. Across the border in Tijuana, the number of Central American migrants who arrived in a caravan in November has dropped from 8,000 to 2,000. Those remaining are waiting for their turn to ask U.S. officials for asylum or contemplating brincando el muro — jumping the fence — to surrender to agents. Scott said his agents have arrested more than 2,500 migrants from the group who crossed the border illegally, pushing aside or climbing over old sections of sheet metal fencing. Critics have lambasted San Diego agents for firing tear gas at groups of migrants who attempted to breach the border barrier in two separate incidents in the past few weeks. 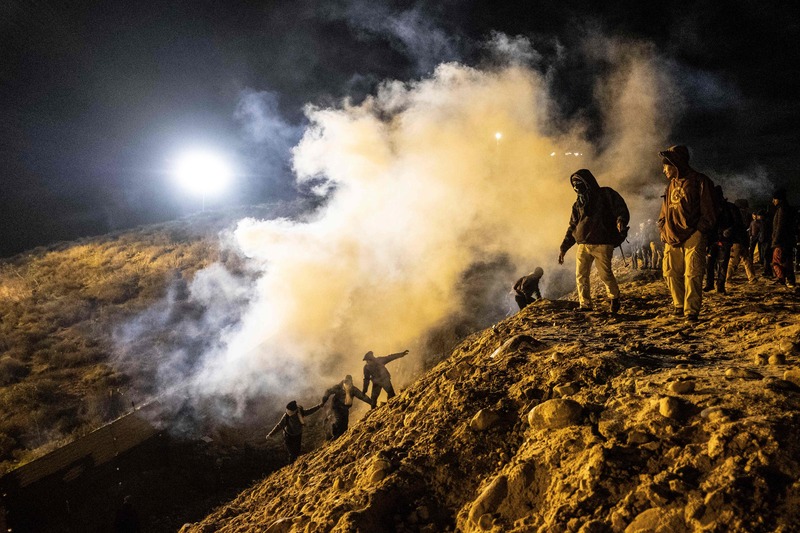 Photographers captured images of mothers and children running from clouds of gas. Scott said his agents were being pelted with rocks from the south side of the border. "My agents have a right to protect themselves and will continue to do so," he said. "When they are assaulted, they will respond in the safest manner they can." Both incidents are under investigation by CBP's Use of Force Review Board. Since the last tear-gassing on Jan. 1, caravan migrants are deciding not to cross illegally in big groups in front of news cameras, said Soraya Vazquez Pesqueira, a Tijuana attorney and immigrant activist. "They've seen that there is a violent response from the U.S. authorities. Now if they cross illegally, they do so individually or in small groups, that don't call attention to themselves. They're more careful." Central American migrants run away from tear gas thrown by the U.S. Border Patrol, after they tried to cross from Tijuana to San Diego on Jan. 1. U.S. border officials allow about 40 to 60 Central Americans from the caravan into the San Ysidro Port of Entry each day. Those who seek asylum are usually released with an electronic ankle monitor and given a date to appear before an immigration judge. Those who are simply looking for work, which Scott says accounts for the majority of Hondurans he sees, are detained and deported. On Dec. 20, Homeland Security Secretary Kirstjen Nielsen announced a "historic measure" that would require all asylum-seekers at the Southern border to return to Mexico and wait there while their cases are resolved. The dramatic policy announcement was the administration's attempt to cease the "catch and release" of migrants who come to the U.S. border seeking protection. Customs and Border Protection is spending $10.5 million per mile to replace 14 miles of old fencing with 18-foot-tall, state-of-the-art, steel bollard barrier between San Diego County and Tijuana. A senior administration official familiar with border security negotiations, who asked not to be named, told NPR the "Remain in Mexico" policy has been suspended for the time being, because of "diplomatic complexities." Mexican officials have expressed concern that their northern border cities cannot accommodate thousands of additional poor migrants waiting around for months while their cases wend their way through backlogged U.S. immigration courts. A spokesman for Mexico's foreign minister told NPR's Carrie Kahn that he does not have any information about a suspension of the program nor any comment.